The high pressure torsion process compacts the material under very high pressure between two plungers producing a very specific material microstructure. Ultrafine grained materials offer substantial advantage over coarser grained materials displaying higher strength and better ductility. Among the SPD techniques, HPT process is one of the most powerful techniques to prepare ultrafine-grained (UFG) materials owing to non-homogeneous deformation with large strain gradient. Ultrafine/nano-grained materials have advantages with higher strength and better ductility over their coarse-grained ones. 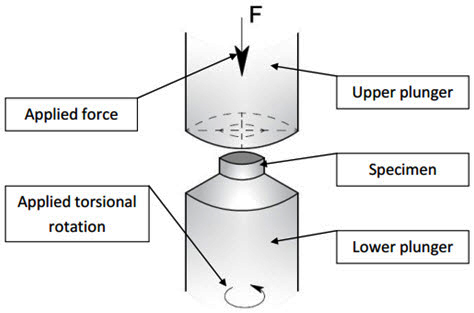 In the HPT process the material is compacted under a high pressure between two plungers via a hydraulic mechanism; a schematic view is shown in Figure 1. As a starting material, for example, bulk materials or powders can be used. In this case the plungers are made of commercial steel. The upper plunger is fixed, while the lower one can perform a torsional rotation with different speed of revolutions per minute. Such rotation is exerted after the compressive pressure is applied. During the HPT process high plastic strains are realized, resulting in fully dense bulk materials with microstructures in the nanocrystalline (nc) and/or ultrafine grained (ufg) size. The HPT process has three main limitations: first, the sample shape is in the form of disk which is not suitable for many industrial applications when compared to wire or sheet forms; second, the sample size is generally limited to a maximum of 35 mm in diameter to maintain a high degree of applied pressure; third, because the strain is generated in proportion to the distance from the disk center, an inhomogeneous distribution of microstructure is developed across the diameter. In order to overcome these limitations, the HPT using ring shape, which is more appropriate than disk shape for industrial application, was introduced with a simple modification of the earlier design. Using the ring HPT, it is possible not only to eliminate a less-strained and coarse-grained center part but also to scale up the sample, for example, to 100 mm in diameter. As another attempt to improve the sample shape, the high-pressure sliding (HPS) was developed for producing sheet metallic materials with 5-mm width, 0.8-mm thickness and 100-mm length. In both ring HPT and HPS, the sample size is still limited because the pressure is sacrificed with any increase in the sample size. For example, in order to process with HPT for disk with 500-mm diameter under a pressure of 2 GPa, the compression load should be 39,000 tons. In order to process with HPT for a ring with 500 mm in outer diameter and 3 mm in width under a pressure of 2 GPa, the compression load should be 940 tons. For HPS processing of a sheet with 500-mm length and 5-mm width under a pressure of 2 GPa, the compression load should be 500 tons. On the other hand the HPT is a useful process for the investigation of cumulative strain, applied pressure, and rotational speed on the structure and properties of the material concerned. HPT can also be used for the consolidation of nano-structured powders, such as cryomilled Al-7.5wt.% Mg, structure. As pure aluminium has less strength and alloying elements are added to improve their properties of strength, hardness in industries. However the result is loss of some useful properties like conductivity. HPT inducts high strength in pure metals without using alloying elements and hence it is preferred over others.